» Albany’s no-go zone: How’s it working? Albany’s no-go zone: How’s it working? 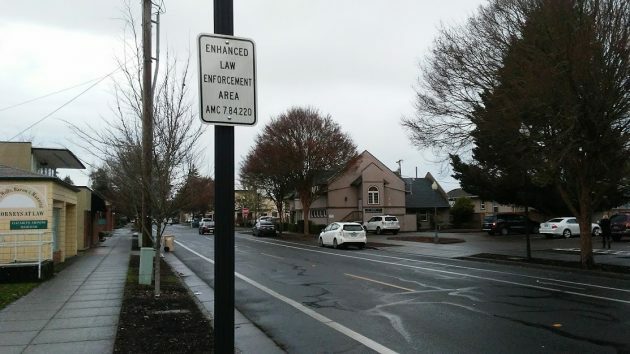 It’s been nine months since the Albany City Council voted to establish an exclusion zone in the central part of town from which the city judge can banish repeat offenders for up to a year. So, has anyone been barred? As it turns out, yes. On Sept. 19, the municipal court ordered a 64-year-old man to stay out of the “enhanced law enforcement area” for three months. He apparently did so. He was charged with criminal trespass on Dec. 20, one day after his banishment was over, but it’s not clear if that citation was given inside or outside of the exclusion zone. After a good deal of impassioned public testimony for and against, the city council adopted the ELEA on March 28, hoping it would cut down on criminal activity within a large part of central Albany. The designated area stretches from Elm Street in the west to Pine Street in the east, and from Pacific Boulevard north to the Willamette River. It includes Bryant Park, Albany Station, and the Portland & Western rail yard. The law says anyone convicted of three offenses within the area inside a period of six months commits the “crime of persistent violation.” And anyone convicted of that offense may be expelled from the ELEA for between three months and a year, except to reach necessary services. In September, in response to a federal judge’s ruling in an Idaho case, the council dropped camping on public property as one of the offenses mentioned in the law. The convictions that triggered the three-month expulsion of the 64-year-old included two for criminal trespass and two related to consuming liquor in public, such as in a park. The man was described to me as a regular in city court. Hmmm, so does anyone think that this law keeps people from committing crime? They just need to walk across the street and commit the same offense on the other side of the street. All this does is push the crime ridden areas to a larger portion of town. Way to go counci, Brilliant idea! The City code is essentially unconstitutional, but the Albany City Council would never let anything so inconsequential as a constitution get in the way of their mission-driven progress. I had heard that the re-examination of the new law would happen after six months, not “at the end of the year.” I am still waiting to hear the follow-up report, too.